Phabian comes from a village called Magunga, Buhemba in Musoma town where he was living with his mother for about two years after the death of his father. The mother is HIV positive and has been ill from time to time to the point that she sometimes loses conscious and can’t even look after her son because she also needs a lot of looking after herself. Phabian’s mother is Christian and attends the Pentecostal Evangelistic Fellowship church in Buhemba Musoma when she is feeling betterl. 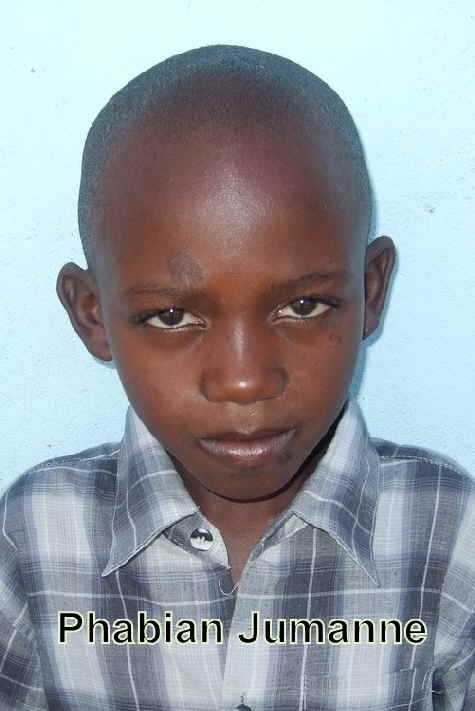 Therefore, over the past two years (2010 – 2012), Phabian and his mother were being looked after by the local church. Looking to the interest of Phabian the church leaders thought it would be a good idea to find a safe and secure place for Phabian to be looked after and even to get some education as they can’t guarantee that they will be able to provide for a boy for the coming years especially when his mother is dead because he will not have a place to stay. They went to see the village leader who contacted the social welfare office at a higher level. It just happened that the social welfare in Musoma had been in touch with one the pastor who knows about Bethany so they asked if there is any chance that we could take in Phabian to the Bethany Family. Therefore, the pastor for that particular church (Mr Japhet N.) wrote an introduction letter for Phabian to the village executive officer who wrote to Bethany and his letter (village executive office) was endorsed by the Mara Regional social welfare officer in Musoma. On 21st December 2012, Phabian was brought at Bethany and ever since is settling in very well. Here are some comments from Rehema Joseph (one of the older Bethany girls) who has been teaching Phabian for three weeks now, “Phabian is struggling and learns very slowly. The good thing about him is that, he behaves well and responds positively. He needs a lot of time and attention. He will make it after a while it’s just a matter of time and I am spending an extra hour with him every afternoon when I have done with the others”.